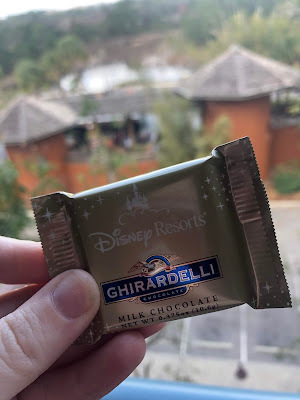 Although the point of not buying any park tickets for this trip was to save money, I figured I might as well spend a bit of time and moolah on non-park experiences while I was at it. So I made an appointment at the Zahanati spa and fitness center for the morning after the marathon. I began by checking in at the desk, which is unassumingly tucked in a corner of the gym by the door. An attendant brought me to a back hallway waiting area - so far not very posh! I was offered a robe and time in the steam room, but as it was almost my appointment time and I was new to the whole business I declined. Promptly at 9am, my massage therapist collected me and brought me into one of the private treatment rooms. Much like the waiting area, it wasn't especially lux or plush, but it was neat and clean. My therapist described the course my treatment would take - back of body, turn over, front of body but no front torso work - and explained that the massage would begin with a hot towel scent treatment. She gave me two scent options and I went with lavender; if I remember correctly the other option was something in the citrus family. She then left the room while I undressed to my level of comfort. Once I was safely ensconced under my sheet, she re-entered and got to work. It went pretty much exactly as initially described - first my back, then my neck and shoulders a bit, then my legs and feet. At that point I flipped and she did my shoulders and arms plus my legs and feet again. The massage was over at exactly 10am, so, impressive timing on her part. Before the massage started my therapist had asked me if I had any particular areas I wanted her to focus on. I noted that I had run the marathon the day before, so she suggested particular leg attention. In the moment it didn't particularly feel like she focused on my legs more than anything else, but as this was my first massage I don't have a basis of comparison. In retrospect I wish I'd asked her to pay the most attention to my feet as they were sore from the race, and OH MY GOD did it feel good when she rubbed them. I would gladly pay for an hour of that, I don't even care if it makes me sound like Quentin Tarantino. Also speaking to the post-race massage topic - I was booked for a custom massage, and my therapist used gentle but firm pressure. It felt good. It did not, however, really get in there with my muscles as I think might be beneficial to athletes. Something to keep in mind if you're looking to put the emphasis on therapy in massage therapy. At the end of my appointment my therapist left the room so I could dress, then walked me to the desk. She gave me a piece of chocolate for some unknown reason, and also told me to drink a lot of water as it's apparently common for massages to trigger headaches in newbies. Go figure. Then it was just a matter of settling up at the desk. I got a 15% discount for using my Disney Visa, but they also added an automatic 20% gratuity. Ah well; at least that meant tip was taken care of for me. Is a massage worth skipping the parks for? I'd say no. It's a nice experience but I wasn't absolutely blown away. I was also a bit disappointed in the overall appointment of the spa, which was pretty plain. Perhaps spas in other Disney resorts are more upscale. That being said, if you've got a little money and time to burn at Disney, you could certainly do worse. Everything's worth trying once, right? 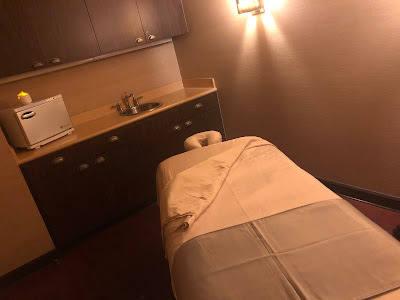 I've only had two massages but I do think they are a little too gentle to make a big difference - I might try a deep tissue massage at some point even though that sounds scary, haha. If I remember correctly Zahanati doesn't offer deep tissue, but I want to say the Swolphin does? Either way I'll have to try it some time, see if it makes a real difference.